An electrode brought to the surface of a liquid that contains microparticles can be used to pull out surprisingly long chains of particles. Curiously enough, the particles in the chains are held together by a thin layer of liquid that covers them. This spectacular phenomenon, discovered with the involvement of Polish scientists and described in the prestigious journal Nature Communications, holds promise for a broad variety of applications. An electrode slowly rises from the surface of a liquid, pulling out individual spherical particles that, just a moment before, were chaotically dispersed in a colloidal solution. 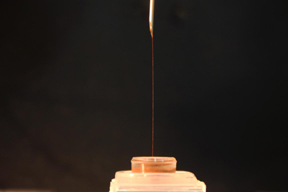 A long, regular chain of microparticles thus forms above the surface of the liquid, in a previously unnoticed phenomenon. It was first observed, studied, and described by scientists from the Institute of Physical Chemistry at the Polish Academy of Sciences (IPC PAS), the Faculty of Physics of the Adam Mickiewicz University (UAM), the Northwestern University in Evanston (Illinois, USA), and the Faculty of Physics at the University of Warsaw. "We've all probably seen our mothers or grandmothers wear necklaces made of beads strung on a thread. The chains of microparticles fabricated and studied by our team look very similar, but they are much smaller in size. However, the most interesting thing is the physics behind this process. The formation of these regular structures is determined by a set of phenomena that are by no means trivial, and the role of the thread that holds together the individual beads is played by... a liquid. What is more, in a necklace, the thread goes through the beads, while our thread, in this case the liquid, actually covers the microparticles," says Dr. Filip Dutka from the Faculty of Physics at the University of Warsaw. "This phenomenon was discovered accidentally, during experiments conducted in the Institute of Physical Chemistry of the PAS," relays Dr. Zbigniew Rozynek, the lead author of the publication in the journal Nature Communications, currently employed at the Faculty of Physics at the Adam Mickiewicz University. "I used an electrode at several hundred volts to examine glass microspheres floating on the surface of oil. When I pulled out the electrode, I was surprised to see a long and very regular chain at its tip. When I examined it under the microscope, it turned out to have the thickness of a single particle." The phenomenon visually resembles one of the most important modern-day technological processes - namely, Prof. Jan Czochralski's method of growing monocrystals - which involves slowly pulling a rod-mounted seed crystal out of molten material. Moreover, this method, which enables the fabrication of high-quality semiconductors for use in the electronics industry, was reportedly also discovered by accident. When writing notes, Prof. Czochralski absentmindedly dipped his pen in a crucible with cooling molten tin instead of dipping it in the inkpot. When attempting to pull out the pen, he noticed a tin filament at its tip that, on closer inspection, proved to be a monocrystal. "The materials that are fabricated using Czochralski's method are crystals, so their structure is regular in all three dimensions. We create our structures using not atoms or molecules but microparticles arranged regularly along only one dimension. With a bit of leeway, we might therefore treat our chains as one-dimensional crystals," Dr. Rozynek says. How can we form such a colloidal chain? We take a container with non-conductive liquid, add spherical and conductive particles, and mix them together. When we bring an electrode (for example, in the shape of a needle) to the surface of the suspension, one of the particles attaches to its tip and becomes an extension of the electrode, which happens because the particles conduct electricity. If we apply an adequate electric voltage, we will be able to pull such spheres out of the liquid one after another, thus forming a chain of particles covered with a thin layer of the liquid. Each pair of adjacent particles is held together by a liquid capillary bridge, forming stable electric contacts. Consequently, an electric current flows through the whole of the chain almost as efficiently as through a single particle, allowing the last particle to attract another particle from the solution. "Hourglass-shaped capillary bridges can be found between each pair of adjacent spheres in the chain. Once the electric field is turned off, they play a crucial role: by holding the particles together, they keep the chain intact. Since the capillary bridges are simply composed of liquid, the chain is highly flexible," Dr. Dutka explains. The chains of microparticles are formed as a result of complicated interactions of an electrical, gravitational, and capillary nature (related to the surface tension of the liquid). Here, gravity plays the role of a spoiler: if a chain gets too heavy, gravity will cut it like scissors. There is much to indicate that such chains could also be formed under zero gravity and could be then of practically any length. "Once they form, the structures created from microparticles behave like chains: they are flexible, meaning they can be bent into various shapes. However, much depends on the type of liquid used. In some experiments, we pulled chains out of molten paraffin wax. Shortly after being pulled, the bridges would solidify and the structure would become rigid. There's also an intermediate option: if we blend, for example, resin and alcohol, the resin hardens as the alcohol evaporates. The chain is then a lot less flexible but not completely rigid," Dr. Rozynek observes. The length of the colloidal chains depends on the number and weight of the microparticles, which is usually closely related to their size. The Polish scientists, supported by funding from the National Science Centre and the Foundation for Polish Science, conducted experiments for particles with diameters ranging from around 100 nanometers to 200 micrometers. Chains formed from micron-sized particles had up to several thousand elements and were up to several inches long. Although the discovery was made very recently, it appears that the attractive properties of colloidal and granular chains will quickly find practical applications. Work is ongoing to apply the phenomenon to the production of thin conductive structures on substrates that vary in roughness and properties. Such structures could be used as elements in flexible circuits, among other applications. Potentially, such chains could also be formed from living cells, which opens the door to possible applications in biotechnology or even medicine.